Gluten Free Pan-Asian Cuisine in NYC! As any of you know that are on a gluten free diet, it is extremely difficult to find gluten free Chinese food. However, those of you that live in the NYC area are in luck because Ruby Foo's, located in the heart of Times Square, has a gluten free menu! For starters, you have the option of munching on Edamame, Chicken Lettuce Wraps, and/or a Grilled Chicken Salad Wrap. And if you are looking to add a side dish to your entree, you have the option of Chicken Fried Rice, Vegetable Fried Rice or Buddha's Feast (steamed mixed vegetables). For dessert, you get to choose one of two tasty treats provided by the Gluten Free company, Foods By George. You can either enjoy the Chocolate Brownie topped with Fruit Salsa or the Warm Crumb Cake topped with Fresh Fruit Salad. They also offer RedBridge (gluten free) beer for you to drink with your meal! NYC's 1st 100% Gluten Free Bakery Has Arrived! On February 8th, 2010, Tu-lu's Gluten-Free Bakery opened in NYC's East Village. It is a 100 % dedicated gluten-free facility! They sell a variety of gluten free products including paninis, cupcakes, muffins, brownies, and cookies. I have found the paninis to be absolutely delicious. I also have enjoyed the cupcakes, cookies, and muffins! Don't forget to also follow Ms. Celiac on Twitter at www.twitter.com/msceliacsays! 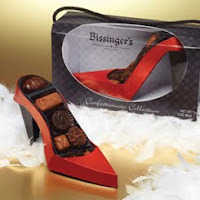 If you are looking for the perfect Valentine's Day gift for someone on a gluten free diet or just would like to treat yourself to some chocolates, then you should make sure to buy some Bissinger's Handcrafted Chocolates! All of their gluten free chocolates are labeled "gluten free." This makes it very easy to determine what you can and cannot eat. I must say that their website, www.bissingers.com, has one of the largest selections of gluten free chocolates that I have seen. For Valentine's Day they feature exclusively the Confectionista Collection (photographed above), Heart-Shaped Dessert Shells, and Bon Bons, which are all gluten free. Have a happy chocolate-filled Valentine's Day! Glutino has always been one of my favorite gluten free brands. I enjoy snacking on everything from their crackers to their wafers to their chocolate bars to their pretzels! Recently, they sent me a box of each of their cookies to sample. This included their Chocolate Chip Cookies, Vanilla Creme Cookies, and Chocolate Vanilla Creme Cookies. I was definitely impressed! The Chocolate Chip Cookies were full of delicious chocolate chips and the Vanilla Creme Cookies were such a yummy snack! My favorite were the Chocolate Vanilla Creme Cookies which reminded me of the days when I used to enjoy my Oreos with a glass of milk - only now I was eating their gluten free version with a glass of soy milk - but it was just as good! Glutino brand products are available to purchase at a variety of mainstream retailers and local health food stores. For more information, please visit their website at www.glutino.com.